Important traits for students in this program include having an intellectual curiosity, the ability to adapt to situations, self-drive and compassion. Students must be able to listen, lead and be observant. Work one-on-one with the college’s certified athletic trainers for hands-on experiences. The athletic training curriculum will provide you with the strong educational foundation you will need for upper-level studies in an accredited program and an athletic training degree. Academic advisors work one-one-one with students to ensure requirements are met for a seamless transition to continuing education. Exercise science is the study of human movement as related to exercise and physical activity from an applied, primarily life science perspective. It is dedicated to promoting and integrating scientific research and education on the effects and benefits of exercise, and to the delivery of physical-activity programs that prevent disease, facilitate rehabilitation, promote health and enhance human performance. Small classes and intensive, personalized instruction will help you excel in the critical foundation courses for your major. Opportunity to closely learn one-on-one with instructors in a lab setting. Opportunity to get involved in a variety of different experiments to prepare students for upper level labs in the major. The exercise science curriculum will provide you with the strong educational foundation you will need for upper-level studies and advanced degrees in the field. Academic advisors work one-on-one with students to ensure requirements are met for a seamless transition to continuing education and professional careers. Physical education develops fitness and fosters the desire for lifelong participation in physical activity. Skills are developed for the ability to perform and enjoy day-to-day physical activities with ease, participate in a wide range of activities and to be physically and mentally active, fit and healthy into adulthood. At the core of any physical education program is exercise. If you enjoy exercise, working out, working with people and working to plan recreational events, this major may be for you. After receiving the associate of arts degree in physical education at Hesston College, many students will continue their education and receive a bachelor of arts degree in physical education with teacher licensure. However, there are many other career opportunities available to physical education majors, including coaching, sports management, community recreation, sports information and journalism, youth camps and business opportunities in the sporting goods industry. At Hesston College, Physical Education candidates learn scientific knowledge, skill-based and fitness-based competencies and instructional delivery methodology necessary for the development of physically educated individuals. In addition to courses designed for physical education majors and teaching licensure, the department offers a wellness course for all students, an introduction to recreational management, and flexible elective courses for majors and non-majors. The goal of the department is for all students to enjoy the benefits of an active lifestyle and develop knowledge of the interconnectedness of the dimensions of wellness. Sports management focuses on the sport industry, including high school athletic administration, intercollegiate sport, amateur sport entertainment, for-profit sport participation, nonprofit sport participation, sporting goods, and sport services. Sports management students share common traits and strength in people skills, teamwork, communication skills, decision making skills, organizational skills, the ability to adapt, and a strong value system. Students work in a variety of sport settings including intercollegiate athletics, major league and minor league professional sports, high school and college athletics, fitness, recreation, and specialized sport business. The sports management curriculum will provide you with the strong educational foundation you will need for upper-level studies and a sports management degree. Academic advisors work one-on-one with students to ensure requirements are met for a seamless transition to continuing education and professional careers. 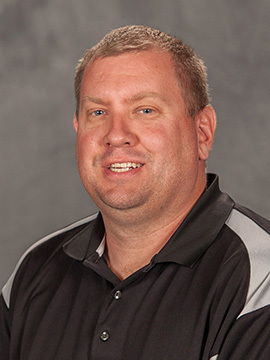 The Hesston College Physical Education Department provides opportunities for students, faculty and staff to acquire knowledge and skills which will assist them in maintaining a healthy lifestyle. Students participate in a required Fitness Concepts class where they learn the importance of living a healthy lifestyle. There is a strong emphasis and opportunity for students to put these concepts into practice. A variety of lifetime activity courses are offered that immediately activate students towards living a healthier lifestyle. 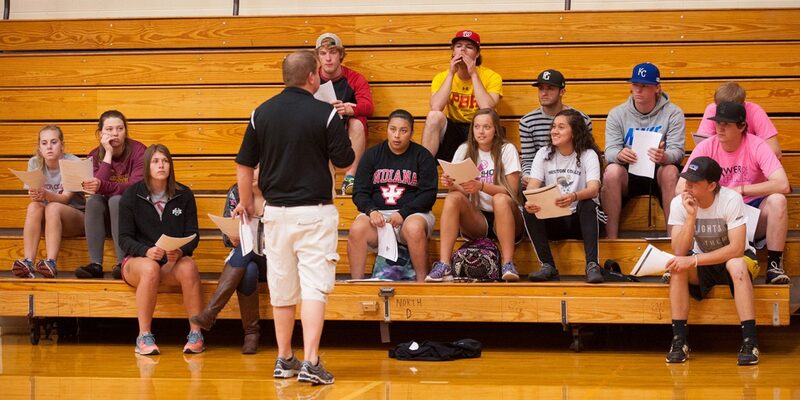 At Hesston College, students in Physical Education are involved immediately in helping others to become active. Students have opportunities through the Recreation Leadership class to plan and host the annual 2 mile fun run as well as assist with the on-campus workplace wellness incentives. 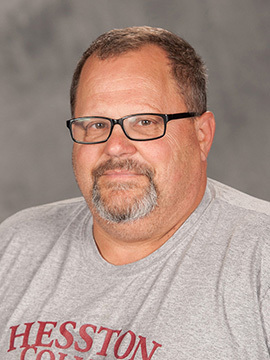 Students will be challenged with a solid foundation of introductory courses that will prepare them for degree completion in a variety of physical education fields beyond Hesston. Faculty and staff, on occasion, join various activity skill classes in order to learn and become physically active. This allows students to see that the quest for fitness and learning in fitness is lifelong. The Physical Education Department crafts various fitness incentives for faculty and staff to participate in during the year. PE students are encouraged to assist in the facilitation of these incentives, providing this students with the hands on opportunity to work with work place wellness incentives. Through sport and play, the human nature is expressed allowing one to learn a lot about people as well as their self through play. Students are offered with a variety of experiences that provide a variety of lifetime activity courses challenging students to be active, whether individually or as a group, fostering improved health and well being. The Physical Education Department also incorporates various workplace wellness programs for faculty/staff that foster improved health and wellbeing. Each year, the department, or on alternating years, the Recreation Leadership class facilitates a two mile walk, jog, run that brings together students, faculty, staff, parents, alumni and others beyond the campus. The Folk Dance class trains students to teach basic dances that are often used in larger campus activities as well as small student group activities. Athletic Training students gain valuable hands on skills through course labs as well as assisting the Trainer through routine practices and game days.